Jenkins Marine are thrilled to announce the addition of a new barge JML30 to their fleet; a new flat top, deck cargo barge. JML30 is the latest addition to the Jenkins Marine fleet and is a 30m by 11.2m pontoon equipped with 2 x14m spud legs for precise positioning, and a 6t/m2 deck loading. JML30 is being put straight to work on the Boston Barrier project, where she is being used as a materials barge to feed the ‘Topjack’ jack-up barge currently engaged in piling at the site. The Boston Barrier Project is £100 Million scheme to help protect more than 14,000 properties in the area from tidal surge flooding, such as dramatically occurred in 2013. Jenkins Marine Smaller Dredge team have been busy dredging local back in Poole with maintenance dredging over three different marinas and boat parks. Dredge pontoon JML60 (18m x 6m) has been fitted with a 22t excavator, which has been loading 150m3 capacity split hopper barge ‘HURST’. 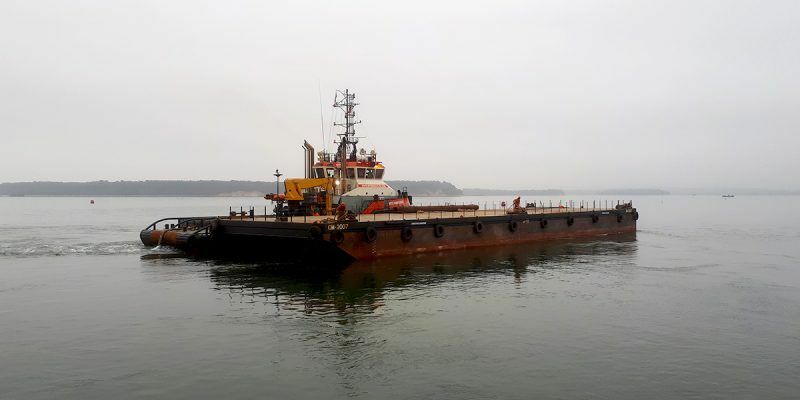 Workboat ‘Buffalo’ has been used to push the Hurst to the sea disposal site within Poole Harbour, benefitting from its recently upgraded higher horsepower engines. These dredging works, like many of our dredge projects, have required careful planning. To access dredge areas with the relatively large dredging vessels requires parts of a marina to be taken apart, with finger pontoons removed, and in this case pontoon piles extracted as well. Working in several different areas of marinas also means completing one area, only to be faced with a period of standing time waiting for it to be put back together, boats to be moved back, and then the next area to the cleared of pontoons. As a result we have been back and forth between these dredge sites, with a total dredge estimated in the region of 10,000m3. Works started in January, and are due to complete before Easter 2018. 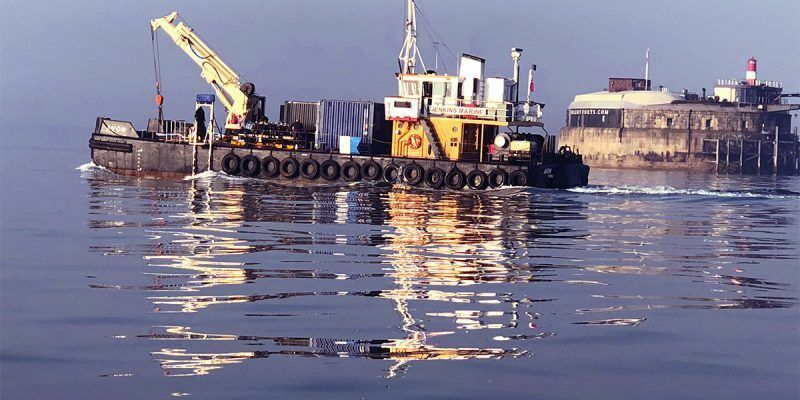 In addition to the dredging works, Pontoon removals and repairs have been required, together with piling works for approximately 15no tubular piles; either new, replaced or extracted and re-driven. Capable workboat STOUR has been used for the piling works, utilising its powerful 68t/m deck crane, and a combination of percussive and vibratory piling equipment. Since the Nab and Needles returned from Scotland in September 2017 they haven’t stopped! 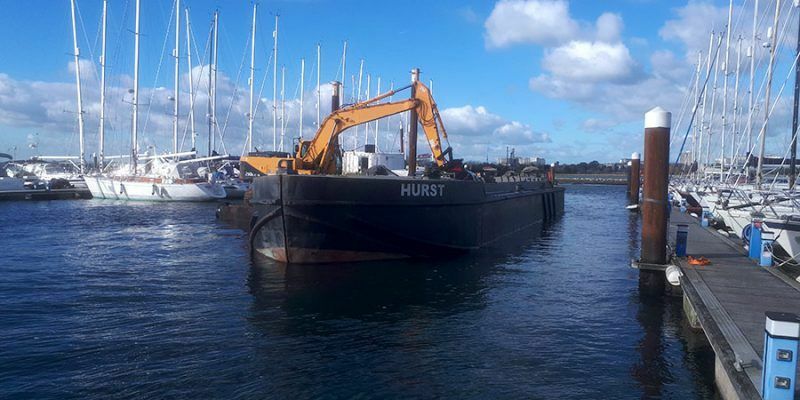 The Doreen Dorward, Nab and Needles started a maintenance dredge in September for Dean and Reddyhoff Marinas at Haslar Marina (just inside Portsmouth Harbour entrance, and opposite the iconic Spinnaker tower), of over 30,000m3. Spoil had to be loaded and transported to sea near the Nab Tower disposal ground off the Isle of Wight. This was completed in November, and followed by some vessel maintenance works back in Poole. 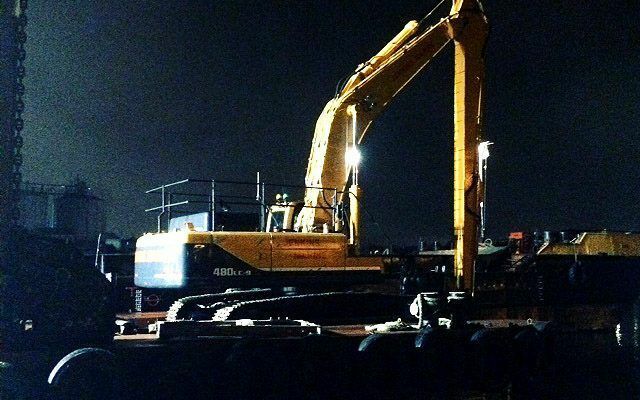 Early December saw us start work in Plymouth for the Yacht Haven’s group using our new 48t long reach excavator. 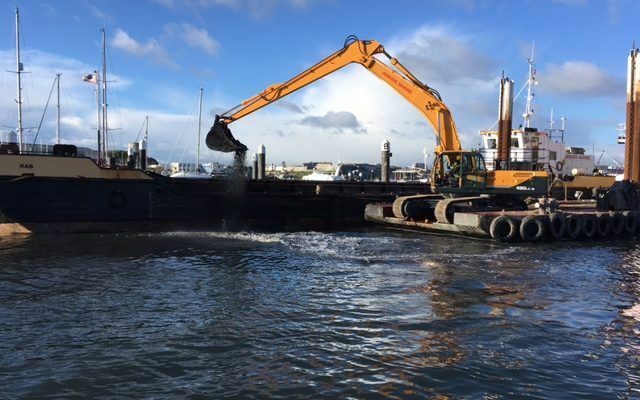 Dredging was required to bring sea bed levels back to original depths at Plymouth Yacht haven, Yacht Haven Quay and Turnchapel Wharf, with an estimated total dredge of 75,000m3. Disposal of dredged spoil is to the newly opened Plymouth Deep sea disposal site outside the approach to Plymouth Sound, which has been closely monitored by the MMO (facilitated by AIS tracking devices on all Jenkins Vessels). Works here are still ongoing in Plymouth, and due to completed just before Easter 2018, ready for the start of the boating season! We are delighted to report Specialist Barge Hire Booming at Jenkins Marine. Pontoons JML50 (50m x 14m x 3m) and JML36 (36m x 10m x 3m) have been on bareboat charter to Marine Civil Engineering Contractors BAM Nuttall. 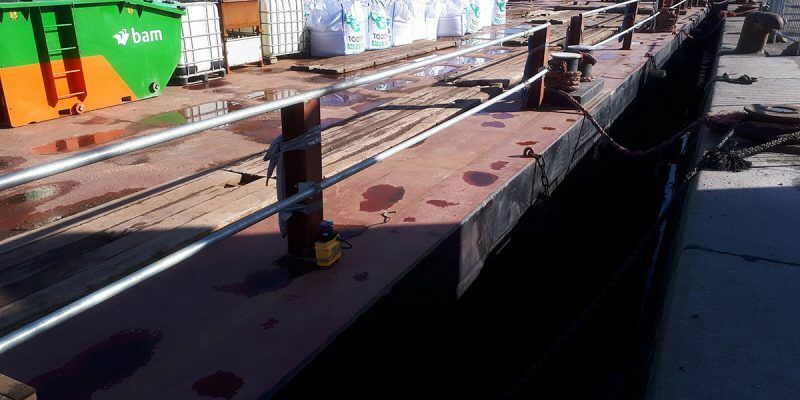 BAM are renovating the Oikos Jetty near Canvey Island, a bulk liquid storage facility constructed in the 1930’s, and requested the charter of both barges for a total period of 40 weeks to cover the duration of the main works on site. Both Barges have been supplied with 20m long spud legs. JML36 is being used as a berthing pontoon for the support vessels on site, while JML50’s larger 1300t capacity is more suitable for transport of construction materials and equipment. Works are anticipated to continue until summer 2018. Buffalo previously had 2 x 160hp L136 naturally aspirated Doosan engines, and is currently being upgraded to 2 x 200hp L136T Doosan engines, to give the vessel increased power, speed and bollard pull. 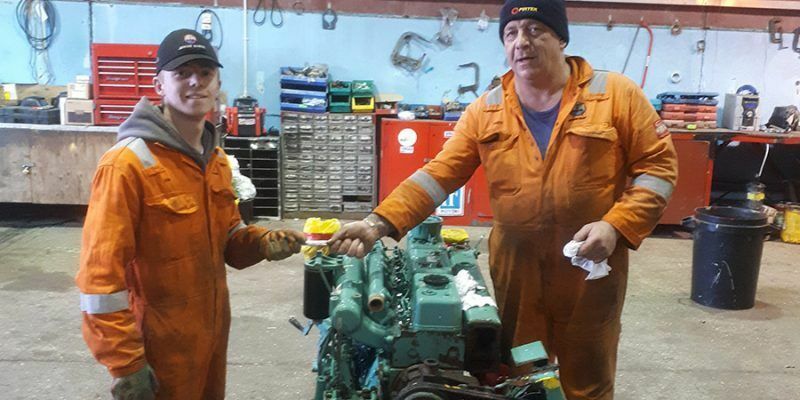 The first new engine has been installed, and the second new has just been delivered and Jon is pleased to be involved in the replacement of this unit, from removal of the old engine, transfer of the gearbox and other components, and installation and commissioning of the new engine. Jon joined the company in late November 2017 as our new Apprentice Marine engineer is able to combine his ‘on the job training’ in the workplace with block release at college where he is studying a 4 year advanced level NVQ in Marine engineering. Jon’s placement demonstrates our continued commitment to training young people and bringing them into the commercial marine industry. Jenkins Marine has continued its investment in new equipment and services recently with the purchase of a new Hyundi R480LC Excavator to upgrade and eventually replace the services of the current 35 ton machine. The excavator was supplied with a custom made 7.5m dipper arm and has a larger bucket and reach than the machine it replaces making it faster, more efficient and cost effective for dredging and similar operations. The longer reach of the new dipper arm allows it to dredge over 1 metre deeper than before. The standard factory fitted short arm is also available increasing the versatility of the excavator for jobs such as rock placement; and the reliable, fuel efficient, Cummins Tier 4 interim & EU stage III B engine is low emission and low noise reducing any project’s impact on the environment. With International Maritime Day in Poole, and Poole harbour Boat show approaching fast Jenkins Marine have been on a mission to take some pride in Poole, their base of operations. and restore some of the local maritime landmarks and features. Having been approached about participating in these forthcoming maritime events Jenkins Marine Director Dan Jenkins took the opportunity to ask the council if they had any plans to get these nautical features spruced up in time for their start but was saddened to here that the council did not believe it had resources to do so at this time. Keen to see the features restored, Jenkins Marine has provided labour, equipment and paint to get the job done – and all at their own expense. For more information regarding any of our other specialist vessels or services please contact Jenkins Marine or navigate to the relevant section of the web site.